5 SERIOUS CHANGES TRUMP HAS ALREADY EXECUTED IN OFFICE...HOW WILL IT EFFECT YOU? On Friday, January 20th, Donald Trump was inaugurated as the 45th President of the United States and a week later he has already made several executive orders and serious changes to Barack Obama’s administration. Several changes will have serious effects on Americans into the future. Below are THE WANNA'S top five changes Trump executed his first week in office. HOW WILL THEY EFFECT YOU? 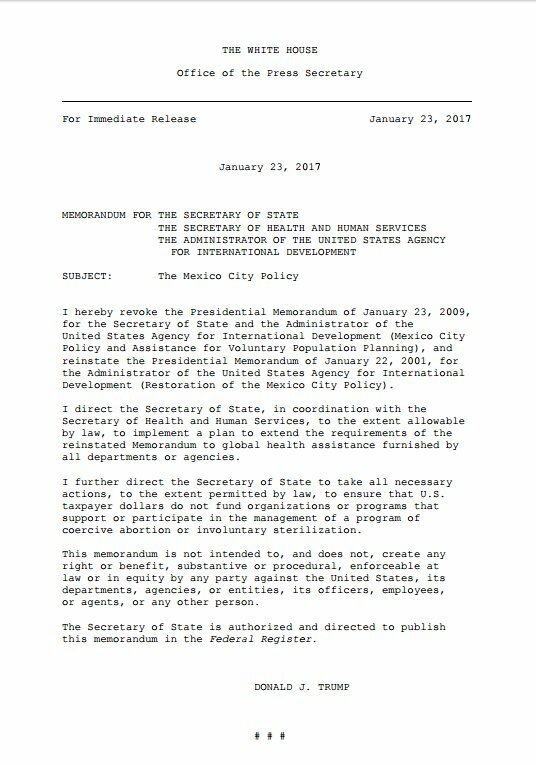 The Monday after his Inauguration, Trump signed an executive order cutting federal funds from organizations that support abortion around the world. The policy is known as the Mexico City Policy, or Global Gag Rule, and it will stop funds going to overseas organizations that perform abortions. Trump signed the order keeping in tradition with every Republican President after Ronald Reagan who signed it. This caused outrage among many, who say that now even more women and babies will die as a result of seeking unsafe abortions overseas. Many people have reacted on Twitter to a photo of the signing that shows several “men making decisions about women’s bodies.” Check out some of the tweets here. Throughout his campaign and after his Election, Trump has promised to build a wall along the length of the Southern U.S. border with Mexico. Trump announced his plans to make Mexico pay for the building of the wall, but Mexico’s President Enrique Pena Nieto refuses to acquiesce. Tensions between the two leaders have grown as Nieto cancelled his planned meeting with Trump following Trump’s tweets directed at Nieto. Now Trump has suggested a 20% import tax from Mexico and other trade countries, which means that Americans would actually pay for the wall’s construction. The wall has been the source of much dispute and frustration among Americans. Check out these tweets about how Americans have reacted to the wall plan so far. The Trump administration halted a cut to the FHA insurance premium rate that Obama had announced in his final days as President. The “mortgage-fee reduction” was meant to go into effect on January 27th, until Trump’s halt. Senate Minority Leader Chuck Schumer asked Trump to reverse his suspension in his opening statement on the Senate floor: "What a terrible thing to do to American homeowners. President Trump, with the flick of a pen, ended that new policy, making it harder for Americans of modest means to obtain their piece of the rock, the American dream – home ownership." According to CNN Money, Trump’s suspension of the FHA cut could majorly affect the American housing market, and make it more difficult for those with “lower credit scores, or those who don't have the traditional 20% down payment in savings” in the future. Trump signed two executive orders on Friday that will expand the military and enact “extreme vetting” of immigrants from "terror-plagued countries." Limiting immigration was another huge campaign promise of Trump’s, and his actions aim to restrict all refugee and immigrant entry to the country. The new order aims to, "keep radical Islamic terrorists out of the United States of America." Trump also implemented a visa ban on people from Syria, and other Middle Eastern and African countries. As The WANNA has discussed in previous posts such as "Celebs Speak Out," many Hollywood celebrities have protested against Trump’s Presidency. Below are some of the celebs Trump has attacked during his time as President Elect. SAG WINNER, ACTOR MAHERSHALA ALI GIVES THE MOST MOVING AND GLOBAL MESSAGE OF THE NIGHT! THE "IT" GIRLS OF SUNDANCE 2017!